Lucky 7 Tattoo and Piercing: Lucky 7 Tattoo Tuesday T Shirt Contest! 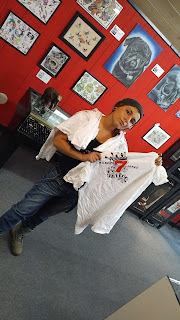 Lucky 7 Tattoo Tuesday T Shirt Contest! Wanna Win a Lucky 7 T shirt boys and girls?! Kathleen managed to wrinkle 6 new Lucky 7 logo gear in her last travels abroad to aid elephants. Being the classy joint we are - can't sell these wrinkled gems - so we are giving them away to our friends of Lucky 7. OKAY - here is the fun part! (all you need is 4 correct to be in the drawing. Your name shall be entered into the "bucket-o- winners"! You can also earn more entries by sharing the contest post on your own social media pages! Facebook, Instagram, Pintrest, Twitter, whatever site you like. Just type "Contest" in your entry email subject line - . OKIE DOKIE - HERE WE GO (pssst...all answers can be found online). What year did Lucky 7 open its doors? Name the only 2 national holidays Lucky 7 closes its doors for each year? What is Russell's last name? The last 4 digits of Lucky 7 phone number spells.....? Where was Russell born and raised? Kathleen has been married 5 times - 3 of her marriages were to tattoo artists. Give the first name of each? This contest ends on Friday, October 28th at 8 pm. So get to work on winning with your mad knowledge of Lucky 7 Tattoo & Piercing! !